Capricorn is the the tenth house in the wheel. It is the house of Career and Public Standing. 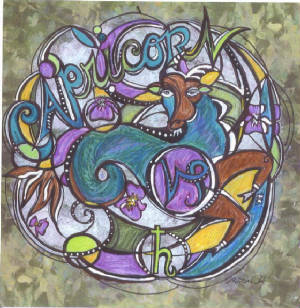 Capricorn begins at the Winter Solstice, December 22 and ends January19. It shows how you accept responsibility. Capricorns are ruled by Saturn, who is also Father Time. They are often work oriented and serious about their profession. They are usually good organizers and planners. They may have an inate sense of timing. They are persistent with their goals and as long as there is still a top, they will be reaching for it. It doesn't take much time to order your own Custom mandala. See MyProducts for details!